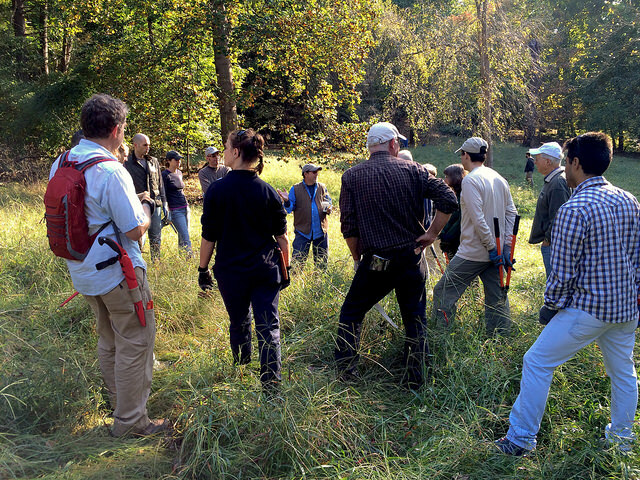 Meadows designer Larry Weaner with group in Dumbarton Oaks Park meadow. October 2014. The meadows of Dumbarton Oaks Park are making a comeback! After successfully launching their Signature Project in the two-acre historic beech grove, Dumbarton Oaks Park Conservancy has embarked on a Meadows Restoration Pilot Project. In building up to this stage of restoration, neighbors and friends of the Park have been volunteering with the Conservancy and National Park Service by hand-removing damaging, invasive vines and grasses from the meadows for the last two years. Their dedicated work has been invaluable in protecting the important meadows feature of the last remaining Beatrix Farrand-designed wild garden. In 2014, it came time for the next steps. Two small meadows in the Park were transformed from non-native, invasive Japanese stiltgrass and other weeds to a diverse mixture of warm season, native grasses. Currently in the middle of a three-year process, the 1.3 acre meadow restoration area will continue to be fenced off while the Conservancy and NPS staff restore the meadows to healthy grasslands that will support wildlife, suppress weeds, and curb erosion. The Meadows Pilot Project proceeded in several stages. First, NPS-approved specialists treated the fenced meadow area twice in June 2014 with with water-safe, low-toxicity herbicides. Shortly after, in preparation for seeding the meadows, the invasive vegetation was be raked and removed. In July, the meadows were seeded (the best part!) with a healthy native seed mixture designed to be self-sustaining, low-maintenance, and beautiful to behold. Larry Weaner, nationally renowned landscape designer and meadows expert, is working with the Conservancy to lead this effort in converting damaged meadow areas of the Park to healthy, sustainable grasslands for all of us to enjoy. Under his guidance, the restored meadows will provide a rare habitat in the District for meadow-nesting birds and other fauna. Once restored, the meadows will continue to flourish and thrive, playing an important part in preventing further erosion and stormwater damage to the hillsides, creek banks, and trails of the Park. For more information about herbicides and vegetation management in Rock Creek Park, contact Chief of Resources Management Nick Bartolomeo at 202-895-6010, or by email at nick_bartolomeo@nps.gov.